There are some groups of people that rely more on their reputation than others – primarily, because their living depends on it. These are celebrities and politicians, and also lawyers and real-estate agents. They are the first to ask the agencies to handle their online reputation and pay impressive amounts of money for things that most businesses do themselves: SEO, SMM, content creation. Knowing how reputation management works for celebrities and politicians can be quite useful for a number of reasons. Firstly, they might do it better and use more interesting tactics. Secondly, they get into social media crises more often than companies, and it’s important to discover how they manage to get back on track. And finally, if you’re building a personal brand, copying what celebrities and politicians do will often be more useful for you than learning the tactics from brands. Online reputation management is the image of a given person on the Internet. Let’s break down reputation management into two camps. First one is reputation management in search engines, such as Google and Bing. The second one is reputation management on social media. First one takes care of what are the search results for when the person’s name and everything related to it is looked up online. For example, no political candidate would want to see some minor scandalous event from when she was eighteen in the search results. Yet they may well be there, or even in search suggestions that are common in Google. Social media involves handling the negative and facilitating the positive on social media, which involves reviews, comments, posts, likes/retweets, and so on. There’s also a third camp, which is taking care of digital privacy. 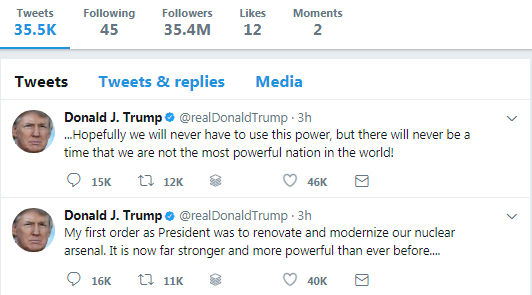 It’s important to remember that Internet isn’t just real people, it’s also bots that attack big followings and groups for their own benefit. The process of reputation management can also be broken down, this time in four blocks: monitoring, reacting, creating and SERM (search engine reputation management). Social Media and Web monitoring is the first and most essential part of any reputation management program. The Internet is dangerous and unpredictable when it comes to celebrities and politicians, and the disaster can arise from anywhere. It can equally be a tiny local news site that will start with a viral opinion or a video blogger with thousands of followers. You have to keep your eye on everything. Depending on the field, it’s also not enough to monitor your name. You have to monitor your slogan, campaign, hashtags, works, or anything else related. It’s a huge piece of work – no wonder famous people prefer to leave it to the experts. The agencies, in turn, use tools such as Awario, Brand24 and Mention. Once you find all relevant mentions online, you have to react to them. Not necessarily to every one of them, but to the ones that seem influential. Some tools have built-in analytics that help you decide which mentions are more influential, depending on, for example, the author’s following or the nature of the comment: negative, positive, or neutral. Reacting to positive mentions isn’t usually a problem. A simple “like” from a celebrity can do absolute wonders – so if you’re on a spree to build a personal brand, you should definitely react and show your appreciation of the followers. 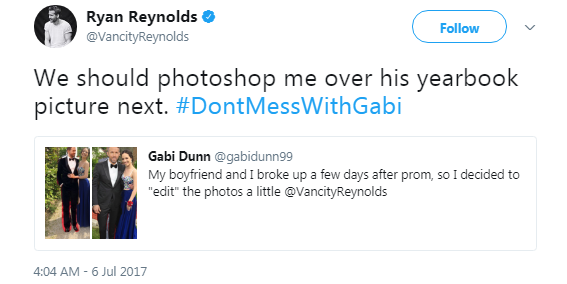 Or sometimes reply with something ridiculous, like Ryan Reynolds does. Reacting to negative mentions is, understandably, a harder task. It involves judging all aspects of a situation, replying with a solution, in a humorous way, or even simply ignoring the situation. Again, this doesn’t stop at social media. Reacting on blogs, forums, and even contacting websites that post harmful information is just as important. Proactive strategies is everything that comes from the celebrities’ public profiles: posts on social media, articles, PR and so on. The key is to create the environment that attracts followers, voters, and fans. Creating content on social media, especially for celebrities and politicians, follows the rules very different to the ones on print and TV. While offline information is long-lasting and solid, the information people get online has to capture their attention momentarily and go viral – or it will get lost within the hour. To better understand ways of dealing with creating content on social media, let’s look at the United States presidential election in 2016. 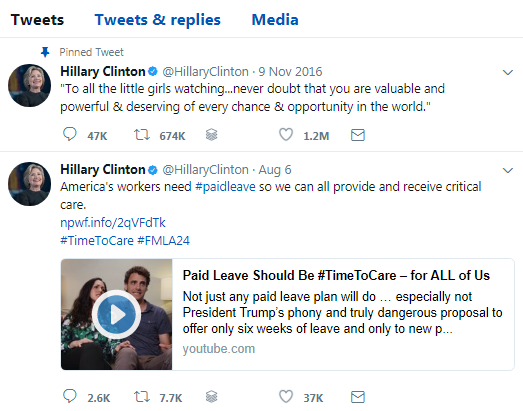 Hillary Clinton’s social media campaign was first of all aimed at informing her followers about her beliefs and, more often, plans. 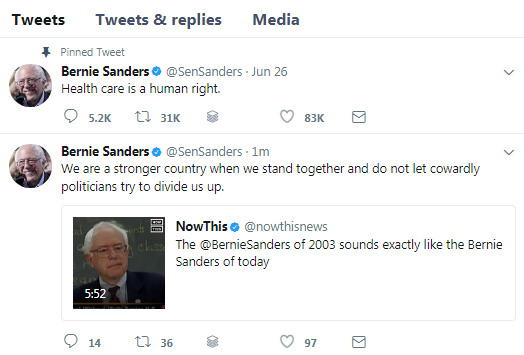 Bernie Sander’s campaign was as emotional, and also aimed at showing how bad other politicians are. And finally, Donald Trump probably had (or has) no thought-through campaign at all. But he’s a natural-born news-maker. Most of his tweets go viral and attract loads of audience and media. The right way to dominate the Internet isn’t to inform – it’s to provoke. “You’re only as relevant as your last tweet”. Donald Trump intuitively feels that and goes with it. Whether such approach is suitable for your brand depends on a number of things, but it has been definitely helpful for Trump. Proactive strategies also often include forming positive online image for the person through using bots, posting fake reviews, and positive comments from fake accounts, and similar “grey” tactics. Finally, there is search engine reputation management. We’ve already discussed the search problems that famous people can face. So what can one do if the negative information appears on the first page of Google search, or even in Google images? The common strategy that agencies use it is to push down all negative information in the search by inserting and promoting more positive information. Once the negative page moves to the second page of Google, it’s not that dangerous anymore – people don’t usually search that far for something they are just vaguely interested in. When the world is listening and the stakes are high, online reputation management is a complex, multidimensional task. However, none of the tasks are qualitatively different from what small businesses and, surely, big ones, have to do on the regular basis. So gather your thoughts, and simply go a bit further than Googling your brand on the Internet.